Inter Milan could have another Croatian in their ranks for the upcoming 2018/19 season after it was revealed that Real Madrid star Luka Modric was mulling a switch to the San Siro. Modric, 32, was a key figure for his country at the recently concluded World Cup, winning three MOTM awards as his side finished runners up to France. Inter already have Marcelo Brozovic and Ivan Perisic in their ranks and have taken Sime Vrsaljko on loan. With three Croatians already on the Nerazzurri’s books, the San Siro looks like an attractive destination for Modric, who has pretty much everything there was to win at Real Madrid. However the question remains whether Real will be willing to sell both Modric and Cristiano Ronaldo in the same transfer window. This may be Real’s best opportunity to cash in on Modric, and the move will also potentially allow more first team football for Mateo Kovacic. Inter are also in the market for Arturo Vidal, but the Chilean’s transfer may not materialise if they get Modric. 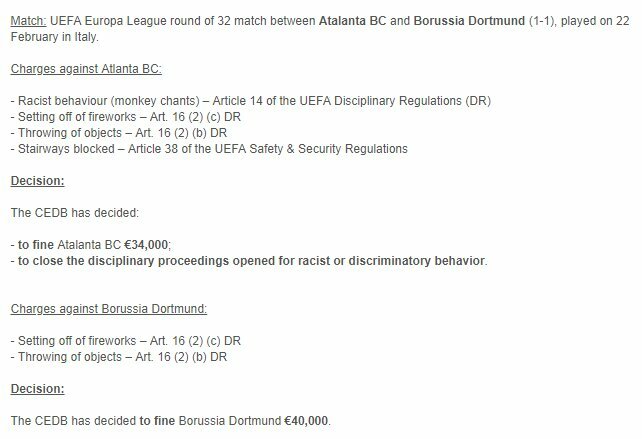 German outfit Borussia Dortmund and Italian side Atalanta have both been fined by European football’s governing organisation UEFA for their transgressions in the Europa League clash that took place between the two teams earlier this year. Here are the charges and the full ruling below. It was a mixed bag for the four Italian teams in action in the Europa League earlier this evening, with two crashing out and two making it to the round of 16. One obvious qualifier was AC Milan, who beat Ludogorets Razgrad 1-0 at the San Siro, adding to their 3-0 first leg win in Bulgaria.